Film Noir Buff: Run away! 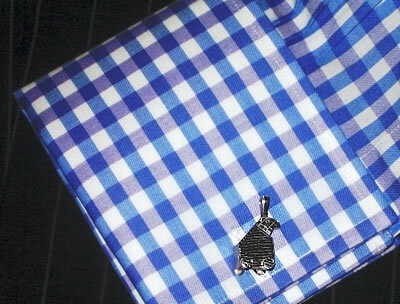 Men get custom everything these days from wool suits and shirts to yachts, cars and wine vintages. Although theoretically, the concept of custom made is anything the customer wants, most items ultimately derive from items the merchant already makes and the customer basically knows how the item will turn out. What about getting something custom made where nothing like it had been made before? Could this produce truly unique experience which might require more effort on the part of both patron and artist? Custom made cufflinks are an interesting grey area between what a client wants and how the jeweler makes it. Different factors determine what themes a customer dreams about decorating his cuffs with in metal or jewels. Is it a pleasant memory from childhood whether Dr. Who or Captain Kirk? Is it to commemorate a favorite team’s championship, showcase a hobby or simply to share a laugh with the viewer? Once a customer’s interest is narrowed down decisions must be made about which symbols or icons best represent it. Further, can the idea be captured with metals, enamels and gems? There is a limit to what can be reduced to the size of a cufflink. Finding custom made jewelers is not easy, finding one who works in the mediums you need or desire with a style that you find compatible is even harder. Most jewelers produce a collection and those are the only items they sell. Unfortunately, this approach makes it harder for them to stay in business independently because the success of their collections is dependent on current tastes. Thus, most jewelers either make things specifically for the trade or remain very artsy. In either case, they are not always as accessible to the retail market as they might like to be. Even when a customer finds a willing jeweler who works in a medium and style which suits what you need, there is another obstacle. Does the customer know what he wants or does he need the jeweler to design it from scratch? The more specific your request, the less design work the artist needs to do. However, if you are too sure of what you want you might lessen how much of his accumulated experience and expression you can call on. In short, you might be leaving a better unexplored design idea on the table. On the other hand, if you only know what you want at the most general of levels it might protract the design stage which in turn ratchets up the cost. Amazingly, sometimes jewelers work in tandem. For example, one does the metal work and another does the enamel, or some jewelers will make the mountings but refuse to set their own stones and send this out to a specialist. Although not unlike a tailor having a buttonhole specialist this greatly increases the cost. Additionally, a pair of cufflinks you have in mind might be a wonderful idea conceptually but may not translate well into either the medium or scale you desire. Detail, expression and recognition may or may not be a feature that suffers. Durability is a consideration as well as personal convenience. After all, what good is a pair of cufflinks so bulky that they continually thump against door knobs? Then there is the issue of cost to the client. How much is too much for a pair of cufflinks that express your style? What is your lifestyle like? Are you likely to leave a pair in the cuff when you send a shirt out to the laundry? Are you likely to remove a shirt quickly during a moment of serendipitous passion? If so, then, perhaps, a $10,000 pair of cufflinks is not for you. But of course if you are carried from apartment to stretch Hummer, you might indeed want to wear some wealth on your sleeve. Most cufflink commissions are by women for men and often for weddings or anniversaries. Women seem to know that custom made jewelry is a possibility; a possibility which never occurs to men and also which is an effort most men cannot be bothered with pursuing. Style can play a role; do you like Gothic or minimalism, retro or futuristic? Do you prefer a dull, shiny, tarnished or satiny finish to the metal? Then there is the idea of dimensions for a man’s jewelry; do you want a small cufflink, or a large one and how much sculpting, etching or inking will you accept on the metal? Although a good jeweler can relate to you what is feasible and what isn’t, it is also incumbent on the customer to know to some degree what they want. Sometimes both customer and artist have a meeting of the minds and hit on all cylinders such as when they share a common sense of humor. The question is how subtle you want the message to be? Do you want passing observers, no matter how superficially aware, to pick up on the association or do you simply want aficionados to appreciate the imagery? What about a combination? Once the general concept is arrived at we enter the design stage. 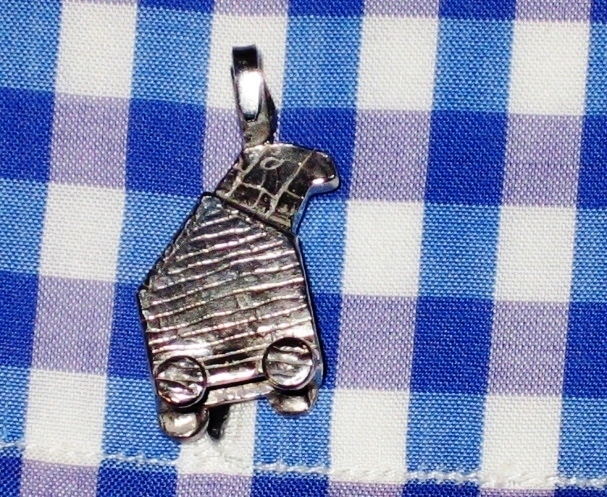 A sketch or a photo is used for reference to in turn produce a CAD image of the completed cufflinks set. Using software called Rhinoceros; the artist can create an image of the jewelry piece’s dimensions and much of its detail which greatly reduces unpleasant surprises throughout the process. Once the design is accomplished, details can be tinkered with and set. A scale is decided on, in the case of the Trojan rabbit, one inch from wheel to ear top. A three dimensional piece was decided on rather than a textured flat. The scale is limited to the cuff buttonhole size. For the outer side of the cuff, the piece can be much larger while the end that goes through the cuff buttonhole must be a certain size and shape. 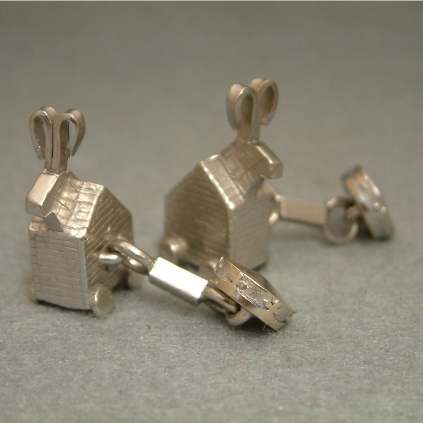 In this case, because the Trojan rabbit was meant to be large (Commercial cufflinks are far too small, mostly for cost savings reasons), it could not be repeated on both sides. Therefore an Arthurian legend helmet was chosen for the other side. The artist needs to keep in mind the relationship between weight of the objects and their balancing points. To keep the Trojan rabbit from spinning around or sagging, it was decided to hollow out its underside and make a solid curved bar to connect to the crown. It was then changed to a heavy rectangle on a chain to offer maximum flexibility and balance and set in a manner that would prevent the rabbit from pivoting. Men generally limit themselves to gold, silver or platinum. To be sure, these cufflinks could be encrusted with diamonds but that, it was agreed, would detract from the intended impact of their message. The ears were cut straight from silver sheets, bent over and then soldered onto the head/body. This practical approach would ensure the ears were more durable than if they were cast along with the rest of the piece. A master is modeled in wax to create uniformity for each of the cuff links’ component pieces whether rabbit, helmet or chain link. Once molded, they are cast in a metal and then filed, sculpted, sanded, polished and given a satin or shiny finish. A lot of hand work is involved throughout the process. For example, after casting, the planks on the “house” looked too smooth and thus the artist rescored them to give a rough hewn effect. Speaking of finishes, a number of finishes could have been used on this set of cufflinks. In this case, a rhodium plate was applied for maximum shininess and anti tarnishing properties. Perhaps, next time, a gold plate may be applied or they could be left raw silver or even antiqued. In the UK, after they are basically completed, the cufflinks are sent to the Assaying office to be hallmarked. The metal is acid tested and the jewelers stamp is punched onto the metal in a place designated with temporary pen mark by the artist. The final set is then polished by the artist and mailed to the customer for personal expression on the cuff of a favorite shirt. The process of getting truly custom made cufflinks is not an easy one but it definitely separates the dedicated dresser from someone more likely to… runaway!